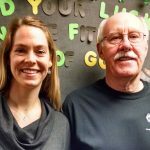 Frank “Frog” Hull has been a patient of Charis Harrison, DPT, and has bravely been fighting cancer while also enduring many treatments for it. His goal is to walk on his own again. 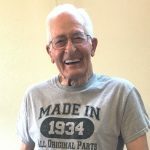 He was a popular English teacher at Beaverhead County High School for many years and he loves to write songs, sing, tell jokes, and play his harmonica. “Frog” had this to say about his Physical Therapy experience, “I give Orthopedic Rehab my highest possible recommendation. The therapists are compassionate, caring, and professional. I am progressing towards my goal of being able to walk without a walker and stand direct on my own.” What an inspiration Frog is to all of us at Orthopedic Rehab. Nice job Charis! I had spent the previous 5 months going to over 8 different doctors multiple times, trying to find out what was causing a terrible pain in my hip and backside. I even had a surgery to remove some of the metal bracing in my back because one specialist thought this was the problem, but to no avail. I left for Libby in May and through a friend, met Tim Whalen. I took him my doctors reports and xrays. Tim knew of my goals and was not too sure of them happening but gave me some exercises to ease my pain. He told me if I was diligent that I would see some results, so I begin the routine. After 2-3 weeks I started to see results and felt better than I had in over a year. After a couple of months on Tim’s regiment, I was able to surprise him with a picture of me and my dog at Leigh Lake. I had accomplished my goal! “I came to orthopedic rehab 2 weeks after I had my total knee replacement on April 13, 2015. I had numerous knee surgeries including 2 ACL repairs and meniscus repairs and removals. After signing up I had a little problem, I was lucky if I could walk a ¼ mile because of neck and back pain that I have experienced from old injuries. This is where Whitefish Orthopedic Rehab comes into play, I was introduced to Andrea when a local Orthopedic Surgeon suggested that while I waited to have my neck fused I try P.T. I was told it probably wouldn’t help but may offer some relief till I decided what I wanted to do. So what I’ve learned in the interim is with a few visits to P.T. once or twice a year I get a new lease on life mostly pain free, and I haven’t had to go under the knife. Now back to the story….when I went to see Andrea the goal was to get me to run a mile. Within four visits I was released, she is a true miracle worker. And I was off and running Forrest Gump style, within a month I was up to six miles, and really thinking I could do this. The Marathon was held Oct. 25 and I was excited to be there, ready or not I was going to do this . With my sister by my side, we joined in the crowd of 32,000 excited/scared runners, with some very motivating speeches about life and running, It’s amazing how much they both have in common. With what we were about to do really struck home when the Commandant of the Marine Corps said “It’s not a race it’s a Marathon, and it’s not about winning but finishing, and finishing well” no truer words spoken and wisdom to live by. Boom the cannon was fired and we were off. This Marathons route sends you through all the Memorials, the Mall, in front of the Congressional building, and so much more. With One Million spectators that come out to cheer you on and the energy that is floating around I knew that I was going to finish this and finish well. 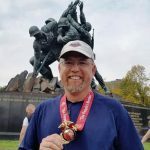 When I crossed the finish line at the Marine Corps War Memorial (Iwo Jima flag raising ) I knew that I had lots of folks to thank for getting me here. I didn’t do this completely on my own, my lesson in this and I hope others can learn, is even though I’m not a kid and I have been banged around a lot in my life. I want and do live an active life, I am an equipment operator for Plum Creek, not an athlete. I’ve learned that for me to do my job and to live the life I want I have to be proactive in seeking out the proper Maintenance for my health care. For me Whitefish Orthopedic Rehab has done this and so much more, they have allowed me to live the life I WANT, they have kept me off pain medications and away from the knife!!! PS I did finish well there were 16,000 runners in my division and I was in the top 1000, for me not too shabby. Thank you and especially Andrea, for giving me a quality of life that I was afraid was lost. 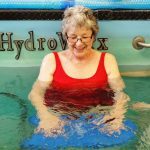 It is a pleasure to tell you how much I enjoyed my experience with the staff at The Aquatic & Spine Center at Orthopedic Rehab. I have had chronic spinal problems for many years. A few years ago I contemplated surgery but was told by a neurosurgeon he would not attempt a surgical approach nor would he recommend I let anyone else do so. I have tried a number of other modalities with little or no success, finally relying on medication alone to ease acute discomfort. When I saw an advertisement for the underwater treadmill treatment of back pain, I asked my primary care physician for his advice. He wrote the prescription and I began the series. From the moment I walked through the door, the professionalism was apparent. The receptionist was helpful, courteous and she was dressed appropriately (an issue that has concerned me in other medical offices). An excellent first impression. The therapist and her assistant were knowledgeable about my concerns, made certain I was safe in each exercise and clear in their directions. As the sessions progressed, they encouraged each bit of progress and I felt enthusiastic throughout the entire course of treatment. These therapists have taught me that although I’m at an advanced age, my musculature can still be trained to help support my spinal structure. I have less pain, better stability, can stand for a longer period of time and have more energy than when i began this journey. My daughter tells me I also walk a lot straighter. I would definitely recommend this practice to my family and friends. Certainly I’d return if i had other problems requiring P.T. The toughest part for me now is to continue the work without my mentors. The United States Gymnastics Team brought home the Gold Medal in Rio, and on a local level, 10 year old Amelia Mason is earning her own accolades in gymnastics after recovering from a serious Spinal Fracture suffered during practice in January. After seeing a Pediatric Orthopedic Spinal Specialist and spending 4 months in a brace, Amelia came to Ashley Wenz, DPT, Clinic Manager of Orthopedic Rehab’s Bigfork Clinic. With Ashley’s encouragement, Amelia went through a rigorous core stabilization program and is now pain free, has full strength, and is almost unlimited in her activities. She is back to riding bikes, jumping on trampolines, playing tag with her friends, swimming and even some tumbling. Ashley had the pleasure of getting to know her mom, Lori Mason, who had this to say regarding her experience at ORI: “It was great! Ashley made my daughter’s rehab fun! I wouldn’t change a thing!” We’re proud of you Amelia and are so happy to know you can once again follow your passion for gymnastics! Winston Churchill once said, “No hour of life is wasted that is spent in the saddle.” and we think Cindy Lindsey would agree! 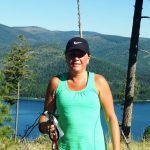 Alena Ori, DPT of Orthopedic Rehab’s Kalispell clinic worked closely with Cindy during her rehabilitation from a partial thickness Rotator Cuff tear. By being committed to her Physical Therapy program administered by Alena, Cindy’s shoulder healed without the need of surgical intervention! 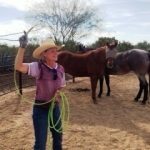 Cindy is now back to running a ranch, doing team roping, and fly fishing up in the beauty of Montana’s lakes and streams. We’re glad you’re back in the saddle again Cindy! Thank you for trusting Alena and all of us at Orthopedic Rehab to help you get back to what you love!!! 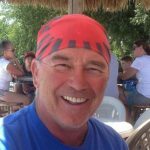 Many of you may know Chuck, who is a native of the valley who worked in the plumbing and heating industry, and as a contractor for 22 years. 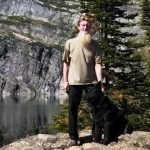 He was involved with the construction of the addition of Flathead High School, other rural schools and additions, and various motels in the Flathead Valley. With his shoulder rehab complete, Chuck looks forward to following his love of working in the garden this summer, fishing, and hunting in the fall. Way to go Chuck! Thank you for entrusting Sarah Schmautz, DPT and Orthopedic Rehab with your Physical Therapy rehabilitation! Ron successfully completed his Physical Therapy program 2 months to the day after he arrived shortly after his Total Knee Replacement surgery. Ron and Carolyn, we thank you for trusting Orthopedic Rehab’s Dillon office to assist you in achieving your goals for your Physical Therapy! Be careful out there Ron! At Orthopedic Rehab, we have the pleasure of helping a wide variety of patients rehabilitate from the painful physical hurdles life sends our way. 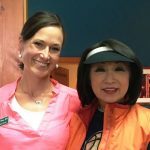 One such patient is Connie Chung, a well respected television news anchor who adopted Bigfork as her Montana home. After breaking her shoulder, Connie has been receiving her Physical Therapy treatment from Ashley Wenz, DPT in our Bigfork clinic. Connie is now well on her way to a full recovery and credits Ashley with helping her regain strength, mobility and for her swift recovery after a painful injury. In Connie’s words, “My experience couldn’t have been better – Ashley Wenz is superb, caring and professional.” Thanks Connie! We appreciate your trust and confidence in having your Physical Therapy with Ashley and Orthopedic Rehab! At Orthopedic Rehab, we have the honor of treating patients who have influenced the lives of many. 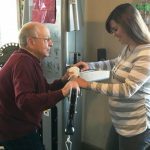 One such patient is Bob Lawson, who worked closely with Amy Fischer, MS PT of our Whitefish clinic, while Bob recovered from a Total Knee Replacement surgery earlier this year. Bob, is a well respected, retired Montana State Representative as well as a well loved Whitefish High School Vice Principal, Teacher and Counselor from 1977-1995. 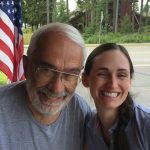 Bob had this to say about his experience at Orthopedic Rehab, “I came to Orthopedic Rehab because of my knowledge and respect for Patrick Gulick, because it (Orthopedic Rehab) is a small-local-stand alone operation and contact with Amy’s other patients. The front office staff was always positive, professional, friendly & helpful – from Visit #1 to #40…As a patient, I had a super positive experience with Amy and other staff members. I am yet to achieve my full goals, but I will continue to work towards these goals. Amy gave me knowledge, skills & attitude. I would recommend Orthopedic Rehab without reservation…Great job of working with what you had – me!” Bob, you inspired us and those around you every time you came to the clinic for your Physical Therapy. Thank you for your commitment to the healing process and for choosing Orthopedic Rehab!